Located in East-central Illinois near the University of Illinois at Urbana/Champaign, the Barnhart-Grove Prairie is in an ideal location for Academic research. From Primary and Secondary School field trips to post-doc research, the Prairie has long been an area destination for people to study the prairie. If you would like to conduct research on the praire, please see our FAQ for more information. For the duration of a year, I intend to achieve a greater understanding of spatial and temporal fluctuations of small mammal populations in grassland settings with respect to prescribed burning. A rather small amount of attention has been paid to the small mammal constituency of wildlife in prairie restoration projects that implement prescribed burning regimes into management plans. For this reason, research into the survival rates, relative abundances, species richness, species similarity and species diversity of small mammals on prescribed burn tracts will be conducted. The placement of herpetofaunal coverboards randomly in the field will be employed as to assess the numbers and species of a primary small mammal predator, snakes. We believe the effects of prescribed burning will be multitudinous; for example, lessened amount of duff can increase predation by raptors, canids and snakes due to reduced cover. A multitude of sites throughout the East Central Illinois area will be included in the study in an attempt to identify region-wide parallels and patterns in small mammal ecology. 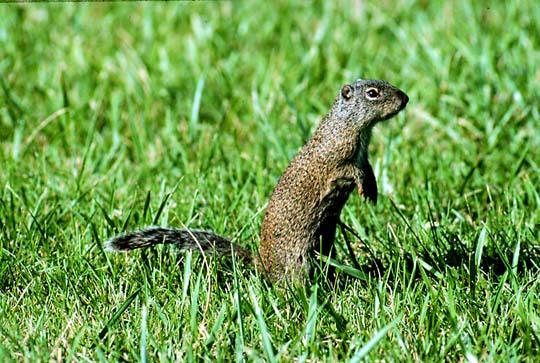 Franklin's ground squirrel, Spermophilus franklinii . Franklin’s ground squirrel (Spermophilus franklinii) appears to be declining in the eastern portion of its range, but current data on its status in Illinois are lacking. In 2001, I conducted a mail survey of 166 wildlife professionals from throughout the historical range of the species in Illinois to obtain information pertaining to extant and extirpated populations, and local population trends. The majority of the survey recipients did not feel that they were sufficiently familiar with the species to assess the status of S. franklinii. Twenty-six sites were chosen for livetrapping surveys to confirm the presence or absence of the species. I considered it likely that Franklin’s ground squirrels persisted in these sites due to information provided in the mail survey and/or known historical occupancy. Trapping revealed that S. franklinii inhabited only 3 of the 26 trapping sites. I also located two other areas of probable occurrence in addition to the locations that I surveyed. While it is clear that Franklin’s ground squirrel has declined in Illinois, the magnitude of this decline remains unknown due to the secretive behavior of the species and a lack of knowledge about its ecology.